1919: Laid down by C. Rennoldson & Co, South Shields (Yd.No.203) (“Castle” class) for The Admiralty as THOMAS GREEN (Ad.No.4216). 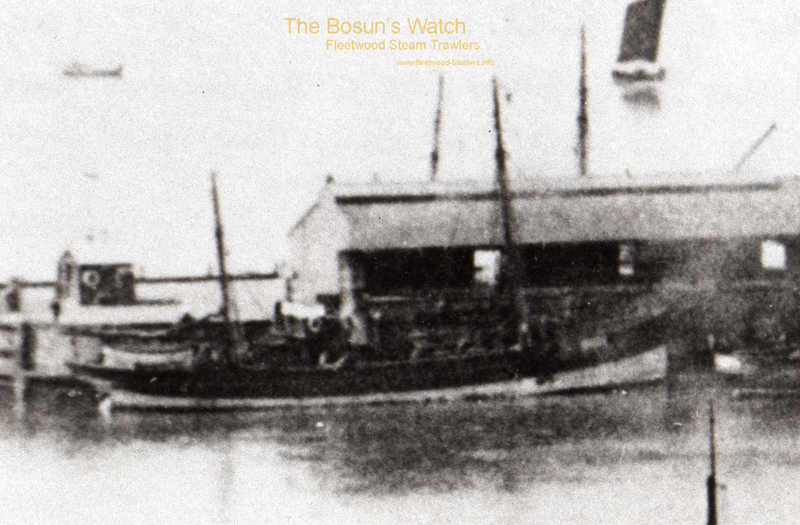 12.1919: Sold to The Ebor Fishing Co Ltd, Middlesbrough. 21.1.1920: Completed as a fishing vessel. 22.1.1920: Registered at Middlesbrough (Part I & IV) as EBOR ELECT O.N.136087 (MH112). Charles W. Robinson designated manager. 1920: Sold to Harley & Miller Ltd, Liverpool. Alfred J. Harley, Meols designated manager. 1923: Charles C. Miller designated manager. 3.8.1926: Registered at Liverpool (LL58). 1928: Fishing out of Fleetwood. 24.11.1928: Last landing at Fleetwood. 1928: Sold to Consolidated Fisheries Ltd, Grimsby. 16.1.1929: Registered at Swansea as CAERPHILLY CASTLE (SA92). Sir John D. Marsden, Bart, Grimsby designated manager. Fishing out of Swansea. 26.8.1939: Requisitioned for war service as a minesweeper (P.No.NI) (Hire rate £85.18.9d/month). 5.2.1940: Returned to owner at Swansea. Lost* – All Swansea. John Pattison (50), Ch Eng; John Anderson Dempster (38) 2nd Eng; James Cecil Cole (31) deckhand. 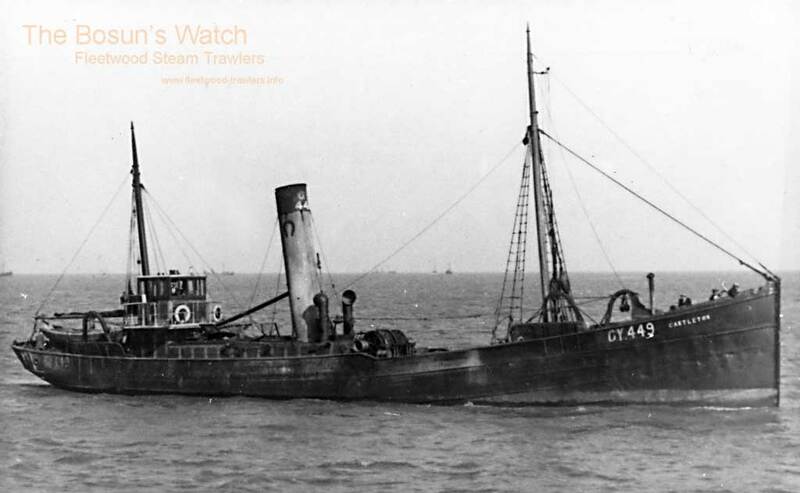 This entry was posted in Lost Vessels, Steam Trawlers on March 8, 2019 by Fred Smith. 1919: Launched by J. P. Rennoldson & Sons Ltd, South Shields (Yd.No.313)(“Castle” class) for The Admiralty as WILLIAM DRAKE (Ad.No.4483). 4.4.1919: Advertised for sale by tender. 10.4.1919: Tenders closed. Sold to Charles W. Robinson, Middlesbrough. 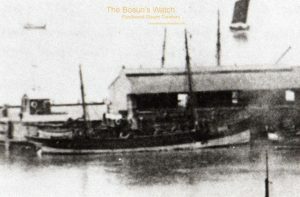 19.5.1919: Completed as a fishing vessel. 13.6.1919: Registered at Middlesbrough (Part I & IV) as EBOR COURT O.N.136085 (MH40). Charles W. Robinson designated managing owner. 1920: Sold to Harley & Miller Ltd, Liverpool. Alfred J. Harley, Meols designated manager. 3.8.1926: Registered at Liverpool (LL56). 12.1928: Sold to Consolidated Fisheries Ltd, Grimsby. 12.1928: Registered at Swansea as CAREW CASTLE (SA91). Sir John D. Marsden, Bart, Grimsby designated manager. Fishing out of Swansea. 31.10.1929: Homeward from the fishing grounds (Sk. Boyce); eleven crew, in company with RADNOR CASTLE (SA56). Entering a fog bank in the Bristol Channel, stranded on rocks near Culver Hole west of Port Eynon Point, Gower Peninsula, approx 18 miles west of Swansea. Badly holed and engine room flooded, RADNOR CASTLE stood by and on the falling tide crew able to walk ashore. 1.11.1929: Tug in attendance, if weather holds expected to be salved. Crew picked up by tug and landed at Swansea. 02.11.1929: Efforts to refloat unsuccessful. 15.11.1929: In rough weather washed further onto rocks and efforts to salve abandoned. Swansea registry closed. 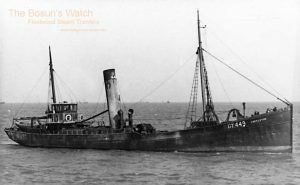 This entry was posted in Lost Vessels, Steam Trawlers on March 4, 2019 by Fred Smith. 1860: Completed at Freckleton for John Noblett, Fleetwood as NIMBLE. 1869: Owned by Frederick W. Rigby, (64/64), Preston. Registered at Fleetwood (FD11). 1886: Sold to Patrick Murphy, Swingpump Lane, Whitehaven. Fleetwood registry closed. Registered at Whitehaven (3/18894) (WN7). 1889: Sold to John Preston Peet, Whitehaven & others (John Preston Peet managing owner). 1890: Rebuilt as a ketch – 23 regd tons. 1892: Sold to John Wright, 12 Senhouse Street, Whitehaven & others (John Wright managing owner). 1903: Wrecked in Strangford Lough. This entry was posted in Lost Vessels, Sailing Trawlers on December 1, 2018 by Fred Smith.